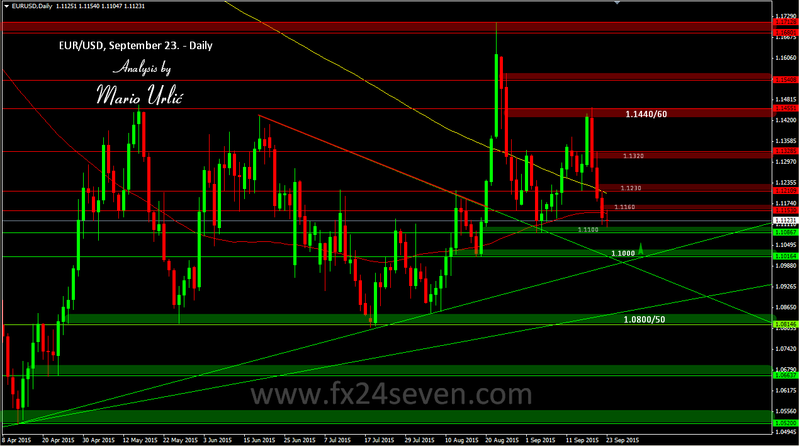 EUR/USD, the serious buyers are waiting at 1.1000!? Tough week for the euro lovers, if there is any!? I usualy analyse at daily chart, but in the last couple of analysis at EUR/USD you sow my prediction targets at H4 charts for intra-day trading and they were good. Well, the pair reached my predicted support at 1.1100 today and that level hold for now, but the furder decline is possible at 1.1000, where the euro buyers could show how serious they are. If the pair reached 1.1000, on my point of view, the bounce must be strong. On the other side, if the pair brake that level, 1.0800 will be in danger for 4-th time after wich the brake is possible. We could see the pair heading toward 1.0500 again in that case. It seams that an interesting period is in front of us, hm, isn’t it always! ?